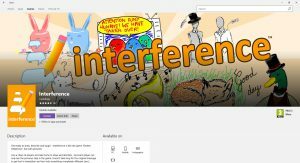 Interference is in Apps for Windows Ink! 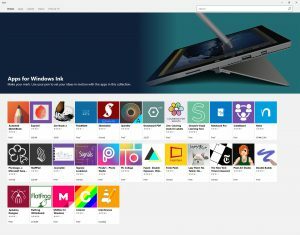 If you’ve been reading our blogs you’ll know that we have been campaigning on social media to get Microsoft to put our drawing and describing game, Interference into the Apps for Windows Ink Collection – a curated collection of apps that are perfect for the Surface devices and pens. Each day we would post on Twitter and Facebook our plea – along with a gif of a particularly good drawing that we’d had submitted to the game that day. … when Jen from Microsoft got in touch and said that they would have a look at it. Seems we didn’t have many recent reviews – as we have forums in the game so players usually say nice things about Interference in there. We put out a plea to our players for a few new reviews in the Windows Store and got them. Then we were told that we could have Interference in Apps for Windows Ink for 30 days – to see how it went. It is so great as we’ve had lots of new players already and get emails from the Windows Store to say that our trends are up. It’s good to know that persistence pays off – we’re not sure how long we will be in the collection – but long may it last!